By default the primary contact will be set as the individual that was entered on the Executive Officer profile page during registration. The primary contact will be listed as the contact on the print packet cover page whether they were the person that submitted the request or not. The primary contact will also be listed in the Summary section of the Organization Summary page, and listed as a contact in the Contact Tab. 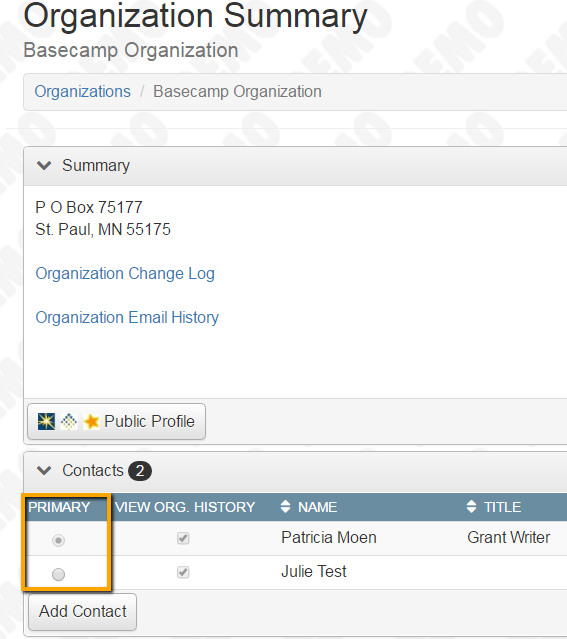 The Primary Contact can be set/changed in the Organization Summary. Click Search in the navigation menu at the top of the page, and then select Organization. Type the name of the organization and click Search. Click on the Organization Name. Select the primary contact by clicking on the radio button in the PRIMARY column to the left of the contact name.